California’s Governor Arnold Schwarzenegger administration has launched what appears to be an innovative interactive communications forum called Waste Watchers. 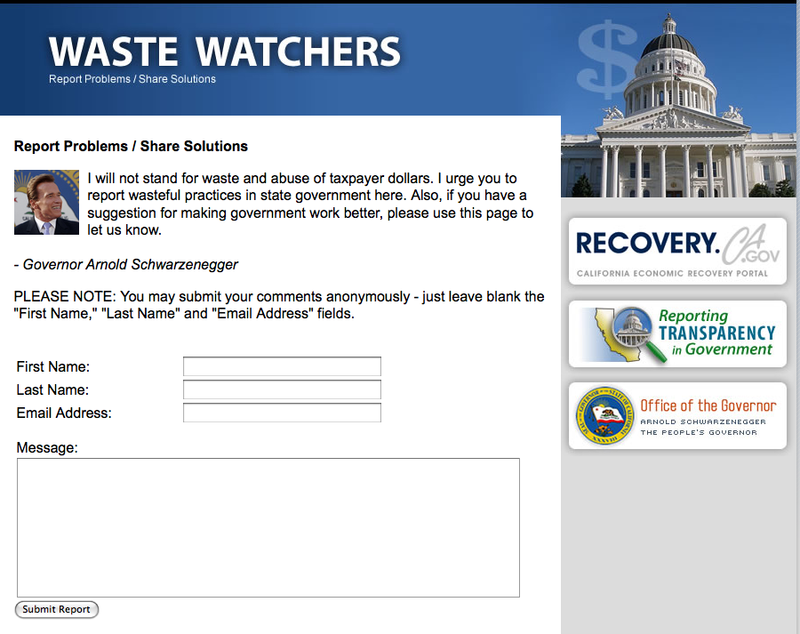 WasteWatchers.CA.Gov asks the citizens of California to “Report Problems / Share Solutions”. I will not stand for waste and abuse of taxpayer dollars. I urge you to report wasteful practices in state government here. Also, if you have a suggestion for making government work better, please use this page to let us know. According to Governor Schwarzenegger Twitter account, the California Waste Watchers site has already received nearly 1,000 reports since inception. With a budget shortfall bigger than many states entire budgets, California by definition has the greatest need of any US State for innovative communication methods to speed both identifying and reducing government waste. The WasteWatchers.CA.Gov site is surely a step in the right direction. This entry was posted on June 16, 2009 at 8:30 pm and is filed under Innovation, Interactive Communications, Twitter, Waste Watchers. You can follow any responses to this entry through the RSS 2.0 feed. You can leave a response, or trackback from your own site.